These guidelines supplement the official rules and are intended as a general quick reference for parents and coaches. The Official League Rules contain additional information regarding the weigh-ins. Only youth between the ages of 7 and 16 years of age and who weigh at least 40 pounds may participate in the FCYFL. All youth shall play in the Age/Weight Division that they are eligible for. There will be no waivers. Commissioners are responsible for checking birth dates and weights at club registration and the official FCYFL Weigh-In. For example, a 10 year old will play in the 90# group if he weighs from 86 to 100 pounds. He may not play in the 100# group unless he weighs between 101 pounds to 120 pounds. 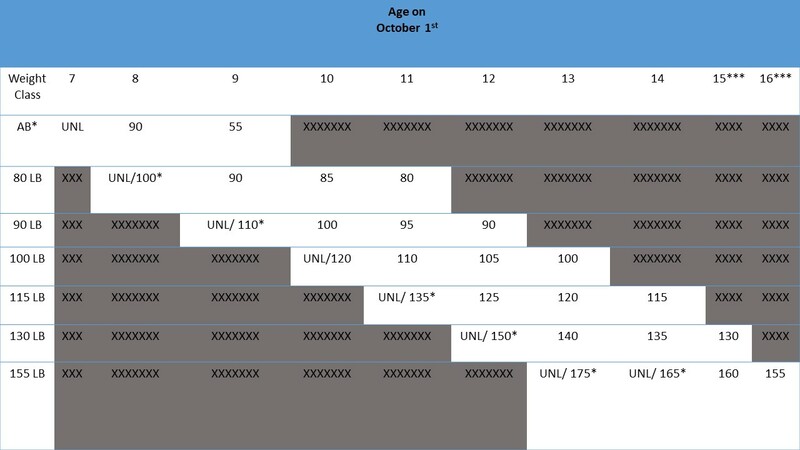 For purpose of eligibility in the various Age/Weight Divisions, a players age on October 1 of the current year will determine his football age. Example: A youth who becomes 10 years old on or before October 1 will play as a 10 year old. A youth who becomes 10 at any time after October 1st of the current year will play as a 9-year-old.